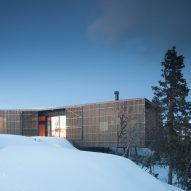 Pine louvres cover the glazed sides of this cabin by Oslo studio Lund Hagem Arkitekter, which forks at one end to present two large windows towards slopes in Norway's Kvitfjell ski resort. 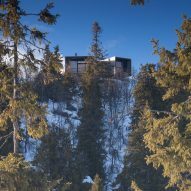 Lund Hagem Arkitekter set the cabin on one of the highest buildable plots in the resort, giving it clear views towards the southeast, where the sloping terrain is populated by birch and pine trees. 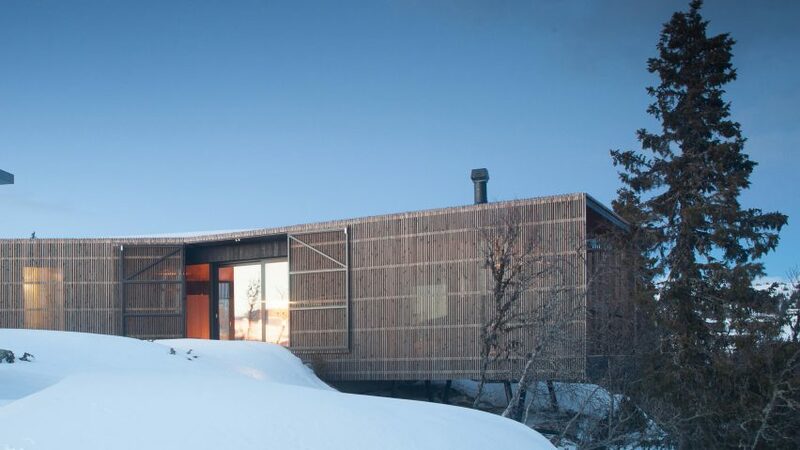 "Our design process was inspired by the client's desire to have 'a summer cabin in a winter landscape'," explained the studio, which has created a number of summer homes along the Norwegian coast. 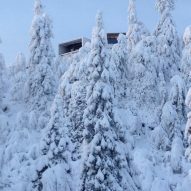 Last year, the team created another holiday cabin for Norway's Geilo ski resort, making less extensive use of glazing than in past projects and lining the interior with dark timber. 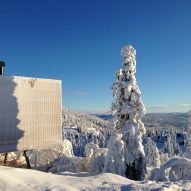 Cabin Kvitfjell combines a number of features of both. While the cabin still features glazed walls, batons of timber covering the exterior give the interior a less exposed and cosier feel. 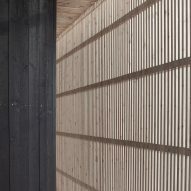 The slats, which also protect a linear terrace, have been treated with iron sulphate that will accelerate the greying process of the wood. 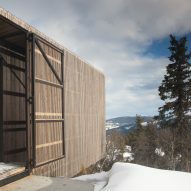 "To continue to build on the idea of the summer cabin in the mountain, the volumes were wrapped in thin, vertical louvres," said the architects. "Given the large planes of glass behind these louvres, where the gallery is, the external walls acquired a 'veil-like' quality towards the courtyard." Inside, oiled oak boards lining the floor and ceiling contribute to this cosy ambiance, and sections of the walls are panelled in dark painted pine. The lounge occupies one prong of the Y-shaped plan and is furnished with fleece-covered chairs and a hanging wood-burning stove, while dark wood-panelled walls and light cabinetry gives the kitchen area behind a starker appearance. A metal island hosting the sink and cooking plate stands in the centre of the room, while crockery, an oven and cooking utensils are hidden away in a pair of deep wooden cabinets. The doors of these cupboards are fitted with pockets for herbs and spices, and hanging pegs for glasses and cups. They can be opened fully to line the walls of the space while cooking. A master bedroom and en-suite bathroom occupy the second prong of the plan, while three further bedrooms run along one side of the tail of the Y. 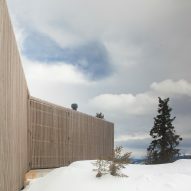 The two prongs are supported by stilts, allowing the building to extend out directly over the edge of the slope, while the main body of the structure sits on the hilltop. 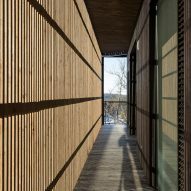 "The main cabin and the annex were built on stilts, raised from the ground, in order to touch the ground in the 'lightest' manner possible," explained the architects. "By placing two volumes close to the neighbouring limits, a kind of a courtyard was created," they continued. "This way, the outdoor spaces could benefit from privacy from the neighbours, while still benefiting from the west/evening sun, during Easter and summer." 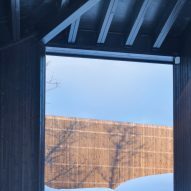 In addition to the 120-metre cabin, Lund Hagem Arkitekter also designed a small annex for the property that can serve as guest accommodation. It contains a further two bedrooms, bathroom and lounge, as well as a car port and a storage area for ski equipment.